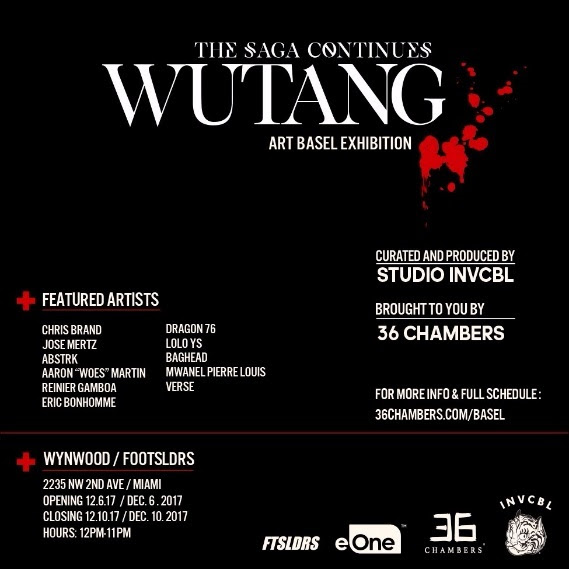 36 Chambers presents a Wu-Tang: The Saga Continues Art Basel Exhibition in Miami, FL this week. The exhibition will be on display from December 6-10 (address: 2235 NW 2nd Ave, Miami, FL 33127-4828) from 12 PM - 11 PM. The Wu-Tang: The Saga Continues Art Basel Exhibition is curated and produced by Studio INVCBL. 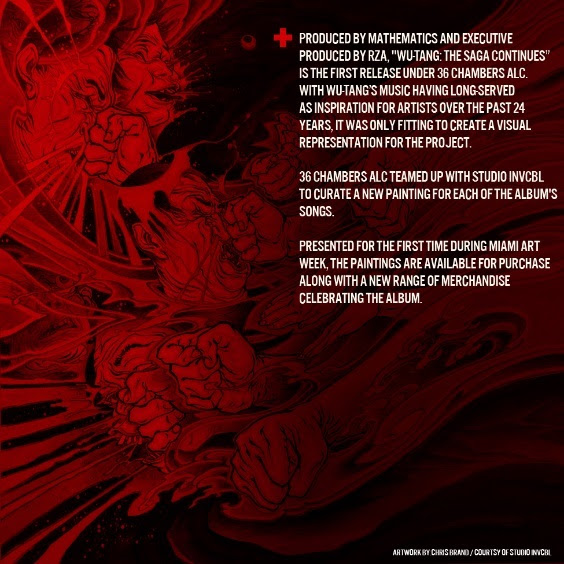 Artists produced new paintings for each of the 12 songs on the recently released album Wu-Tang: The Saga Continues. The paintings are available for purchase, along with a new range of merchandise celebrating the album. As part of the exhibition, Wu-Tang will be partnering with Foursquare City Guide for an Art Basel, in-app takeover and exclusive performance. Members of the Wu-Tang Clan have put together curated lists of the best places to eat and drink, as well the best events around the city as part of their guide to Art Basel, visible exclusively to City Guide app users in Miami. Plus, Raekwon and Mathematics will perform at Foot Soldiers (100 SE 1st Ave,) on Saturday, December 9th, 1-5 pm. Fans will have a signing/photo opportunity and vinyl/CDs will be available for purchase. In addition, Wu-Tang Clan will perform on December 9th at The Black Room at MANA Wynwood (318 NW 23rd Street, Miami, FL 33127) as part of the Art Basel Concert Series. Go here for tickets and information.